There are many myths surrounding living a balanced life. - A balanced life consists of the following breakdown: 25% personal, 25% marriage, 25% children, and 25% work. I believe these ideas are great, but in “real life” these ideas do not work. Balance has two unique definitions. When we talk about balancing our lives, we use a little bit of both definitions. I like the last part of the first definition and the beginning and end of the second definition. So let’s define life balance. Do you have balance in your life? Is your life out of balance? These are questions only you can answer. Of course, your church leader may be able to help you with this question, but at the end of the day only you know how much time you spend with all the various aspects of your life. I believe that it is impossible to give every area of your life equal attention. If you could equal attention to all aspects of your life, I don’t think it would be healthy. In our extremely demanding world, achieving life balance gets harder and harder. However, even with high demands, we must remember those things that matter most. Creating life balance isn’t a quick fix. It is not a one size fits all. The advice and humble suggestions I will give you are just the beginning steps to building a perfect life balance for your life. 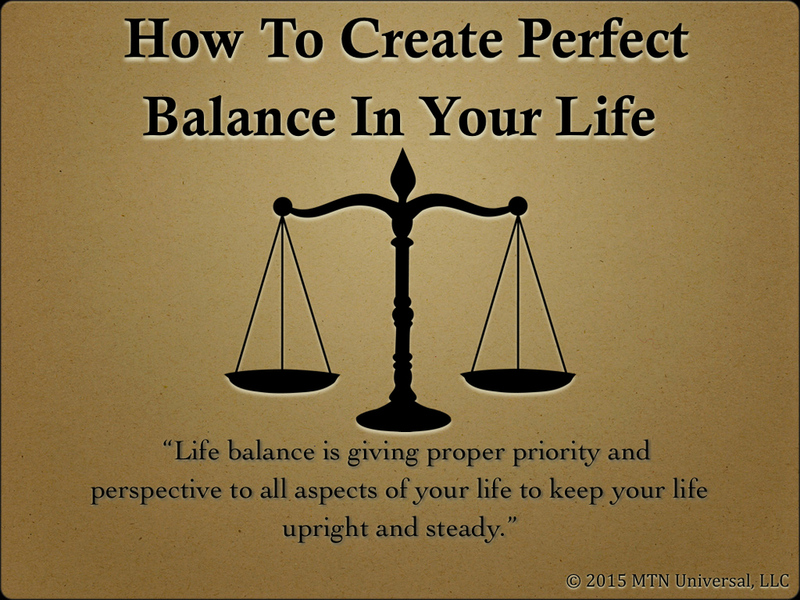 We know how important it is to have balance in our lives, but where do you start? 1. Talk to God. Before you start creating, it may be a great idea to talk to the Creator. Regardless of whether you go to church or not, it is important to discuss your need for life balance with the One who created you. God knows you. This not only works for life balance, but it works for everything else in life. I have a great friend in the healthcare industry that practices medicine. He is one of the finest orthopedic surgeons in our country. He is well known and a well-accomplished surgeon, but the most impressive thing about him has nothing to do with his surgical skills. His devotion and love for God impresses me more than his surgical skills. Before every surgery, this amazing doctor consults with God and prays with all his patients. If you do not know what to say, just ask God for insight. Success with your life balance starts with talking with God. 2. Analyze your life. Only you can do this. This analysis should be an individual assessment. Stop and take some time to look over your life. - Questions Have you talked to God? - How much time do you spend at work? - How much time do you spend with your family? - Do you spend any person time alone? If you answered yes to any of these questions, explain in detail what you are doing if you are spending time is these areas of your life. 3. Prioritize. Now take the information you have learned from analyzing your life and prioritize. Some people think this is the easiest step, but it can be one of the hardest steps. If you have been spending time with everything but yourself, it can be hard trying to carve time out for yourself. Or vice versa with work or family. I think we all know how important family is, but you cannot spend all your time with family and neglect working to provide funds for your family. 4. Develop a plan. Start an action plan. This plan will have various steps to completing your desired goals of prioritizing. It may include setting a specific time when you will leave work if you work excessively. It may be committing a specific time when you will escape from your family daily and read o work out. Whatever you plan to do, make your plan relevant, objective, measurable, and time-related. 5. Stick to the plan. No matter what happens, stick to your plan and make it work! Nothing should stop you from reaching success with you plan. At the end of the day, just remember that life balance is not a one size fit all. Your balance has to work for you and your family. I strongly encourage for you to walk yourself through these five steps weekly, if not daily depending on your need. Start today because there is no reason for you not to enjoy a balanced life. Question: How can you create a better balance in your life? Leave your comments below.